No day of vendors will be accepted, You must be on the vendor list to enter. Nationals show, brought to you by the members of Pickups Limited, Orange County Chapter! The date is Saturday, June 16th, 2018. This is the West Coast’s largest Ford F-100 gathering of the year. 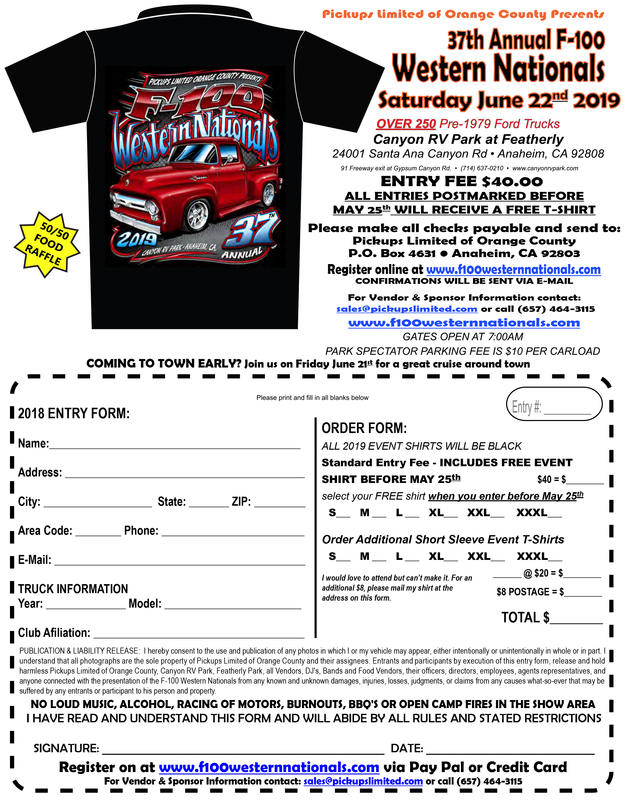 Once again, it will be held in a park-like setting at Canyon RV Park at Featherly, situated in Anaheim Hills, California, just off the 91 Freeway. This is a rare opportunity to exhibit your wares directly to the F-100 core audience so what are you waiting for? Limited space available in our event program which is also dirt cheap! To reserve show space or to advertise in the show program contact us today.